Ramen - This was on the list the first time around and will most likely remain on the list moving forward. Ramen and just about any type of noodle soup is my all time favorite food. I think soupy noodles are the Asian equivalent of pizza or mac and cheese - pure and simple comfort food. I am a total sucker for intense flavor and spice so ramen is a perfect food for me - hydrating, flavorful, spicy, and nutritious (when the right items are included - veggies, eggs etc). I'm making myself hungry just writing this! Red lipstick - It took me a while to jump on the red lip bandwagon, but now I'm a convert. I find that when I'm dressing up for date night or a work function, a red lip really just ups the ante. I could be wearing torn jeans, a tee and clogs and the red lipstick can turn what is seemingly mom-wear into something going-out worthy. Sketchbook - Specifically my small graph paper Moleskine sketchbook. I keep notes in here as well as all of my concept sketches for new hardware lines. I often carry it on the train - it's the perfect size for my purse. My sketchbook helps keep me organized and consolidates all of my ideating into one place. I would be a mess without it. Bryr clogs - I have a love hate relationship with these clogs. I've had a few quality issues with them, but I absolutely adore the fit and the edgy designs. Unlike your regular Danskos or Swedish Hasbeens, Bryr clogs are made by hand to order (the price tag reflects this) and the designs are way more fashion forward. They are comfortable enough to trek around the city or to walk a trade show floor without getting blisters and they really elevate any outfit. Hermes Un Jardin Sur le Nil Perfume - As I mentioned in last week's post, perfumes, and smell in general have a way of taking me back to a specific time and place. Obviously, this is not unique to me. Because of this, when I go on a big trip I like to treat myself to a new perfume at the duty free shops. Last year when Scott and I went to Portugal, I fell in love with the fresh scent of Hermes Un Jardin Sur le Nil. It's now my go-to perfume and conjures up such fond memories of summer and wandering around the beaches of the Algarve and the cobblestone streets of Lisbon. Craigslist - I mean, do people actually still use Craigslist in the land of Chairish, One Kings Lane, and local Facebook groups? The answer is yes. I still find that for the specific item that you are looking to source locally, Craigslist is a great bet. From my entry console ($50) to Lucy's bedroom loveseat ($40) to my King sized brass headboard ($75), I have scored so many amazing items on the super cheap via Craigslist. The key is to know what you are looking for and to keep checking back. Our house - Sometimes I have to pinch myself when I think about the fact that we live in such an amazing house. Living in our 1879 Victorian also makes me feel like a real adult (for better or worse). I mean, it obviously is an adult house when it comes to the amount of money we have to put in for maintenance, but also, when I think about what kind of person would live in our house, the person is a forty or fifty year adult with older kids - not us! So it's kind of weird to think that we live here. It's the kind of house that some would call a forever house. And it will definitely take a lifetime to complete all the projects I have planned, so I certainly don't have to worry about ever being "done". 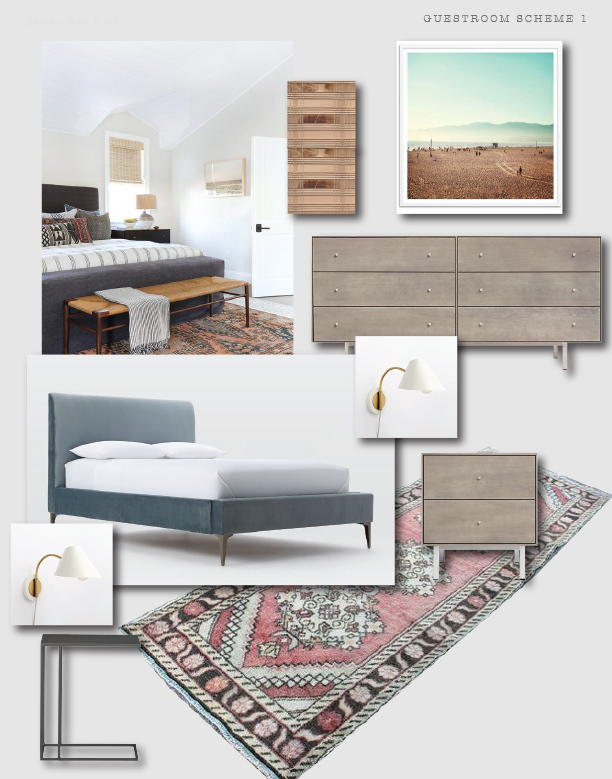 Stay tuned on the blog as we continue to make changes and renovate one room at a time. 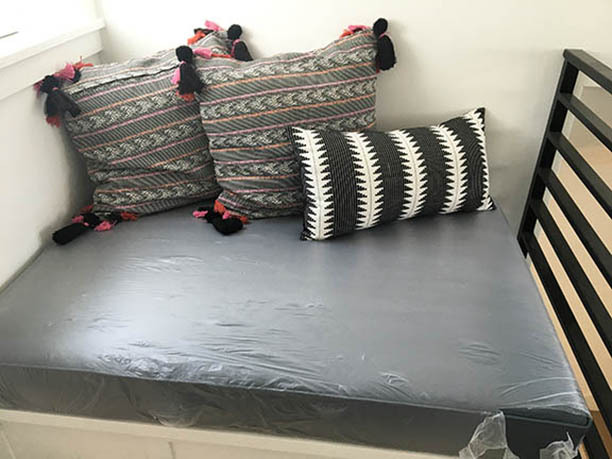 Airbnb - As an Airbnb host for about six months now I have a new appreciation of this site. It provides us with supplemental income for our household, and the user interface and hosting system is really top notch. But I also love Airbnb as a traveller. We've booked homes in the Fingerlakes, Portugal, New Hampshire and Maine for a fraction of the cost of a hotel room (or multiple hotel rooms). Booking an entire home or apartment has become so easy and is so key when traveling with small children - I have no idea what I'd do without it. Vinho verde - This is my summer staple wine. We discovered it on our honeymoon in Italy (I guess the Italians have a local version) and then again when we were in Portugal. It's slight effervescence and lower alcohol content make it refreshing and easy to drink on a hot evening. And the price point doesn't hurt either. Go find some at your local wine shop! Well, that's it folks. 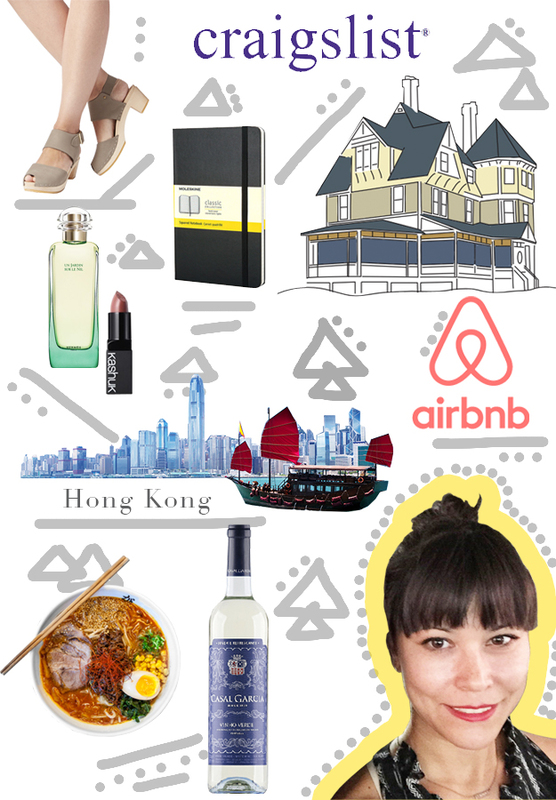 What are your 10 things you can't live without? Stay tuned as we explore our top 10 lists for the rest of the Nest Studio team. Hey Nest Studio readers, it's Kate Cabiltes dropping by for my bi-weekly product roundup. 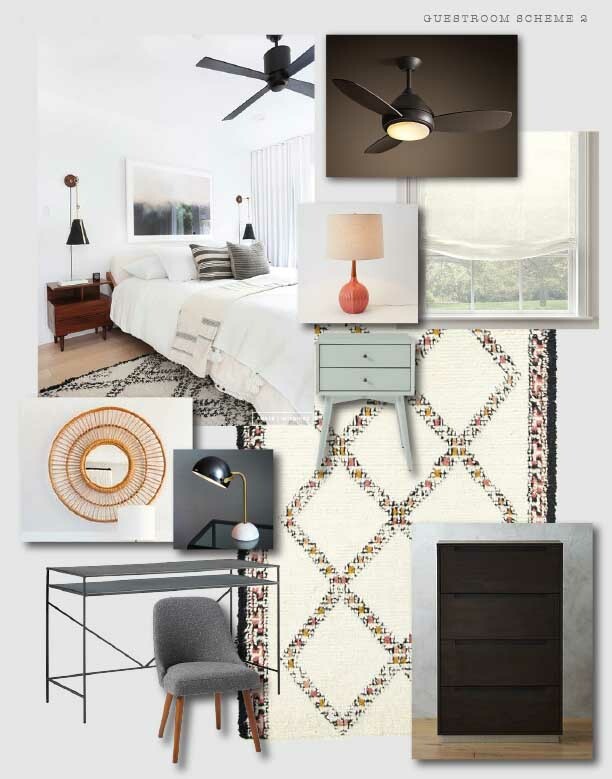 Today I am sharing a warm and cozy bedroom by Cali-based interior designer Megan Tagliaferri of FLO Design Studio. This room is loaded with texture and mid century goodness. 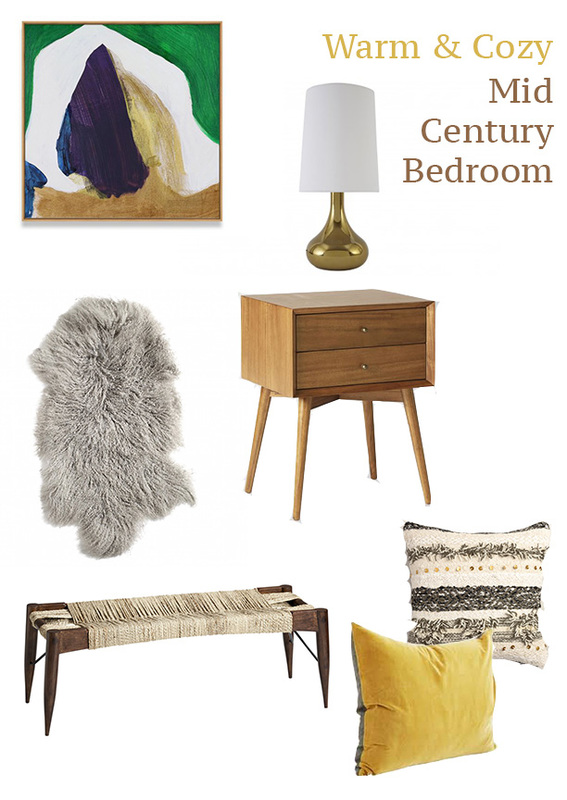 I like how Megan planted a bright mid century painting as a focal piece above the bed and wooden mid century nightstand. She plays with textiles in an array of patterns from the moroccan wedding blanket duvet cover to the geometric kilim rug. 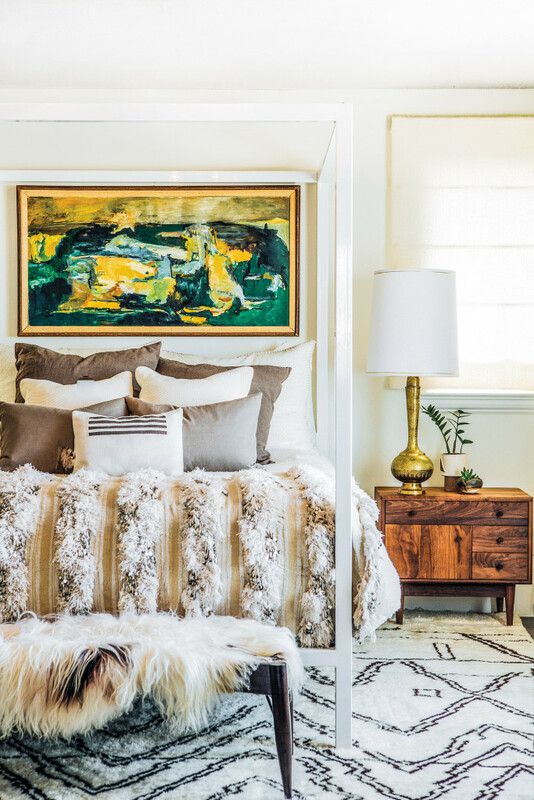 Velvet and striped pillows and a sheepskin rug add even more layers of texture to the room's canvas. This would be easy to replicate by combining a few mid century furniture pieces with textured neutral accents and a few other pops of color such as yellow and green. Vegemite - Yup. I still swear by Vegemite and butter on an English muffin for breakfast but I'm not sure I will be including this in my next list - gotta move on to something more interesting and new. Ramen - Well, since I would definitely need this on a desert island, it is pretty much a given. Silver Birkenstocks - I love my Birks. I now have the white thin strap Birks and they are a summer staple. But I have some other fun necessities of the footwear variety to share with you for 2016. Loreal Voluminous Mascara - Always. J Crew Matchstick Jean - Well, ya know, styles actually change. 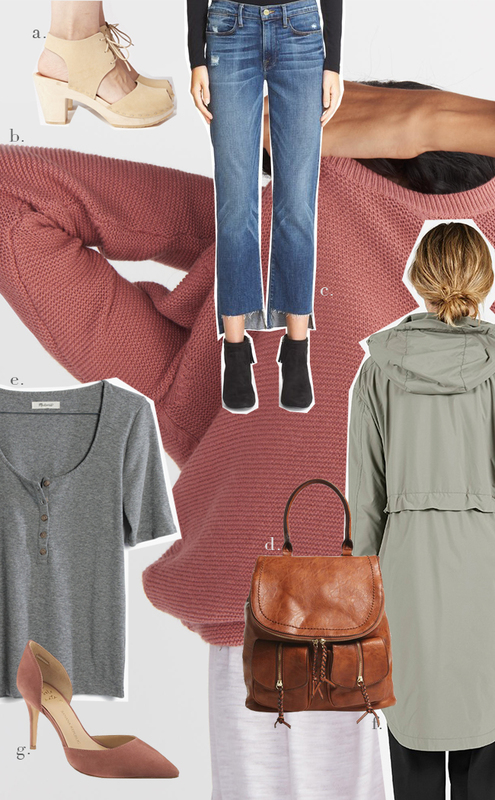 I have moved on to Madewell for all my denim staples but I do have fond memories of the J Crew Matchstick. My Black 2008 Honda Fit - Oh man, I miss that car! Maybe one day I will get another, but in the era of hauling 2 kids, a husband, an au pair and all kinds of other junk, I have moved on to bigger, more mom-like cars. IKEA Svalka Bistro Wine Glasses - These are great. Still an everyday wine staple. Black Sharpies - I use these all the time still, but I think I will bring some other practical items to the list for this time around. Although most recently I have discovered black sharpie for coloring in grey hairs! Kenzo Parfum D'Ete - This perfume was so great! I miss it and wish Kenzo still made it. I discovered it on vacation and have decided vacay is the best time to try and buy a new perfume (because later the perfume will always remind you of that holiday). Can't wait to share my new staple scent with you. 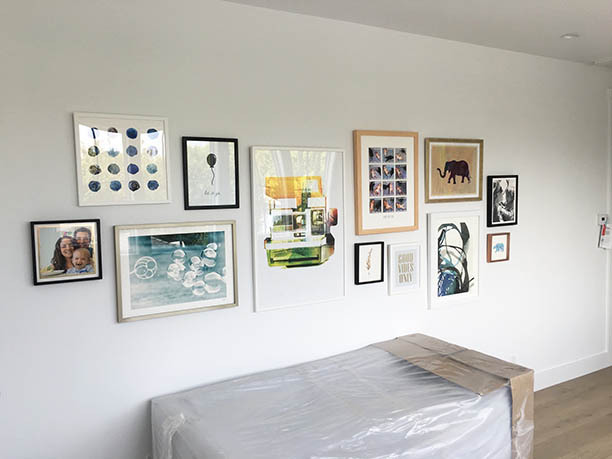 Stay tuned for my new list and a 10 Things roundup from each member of the Nest Studio Team! After coming across the blog Stories by Venice Beach based designer Sarah Sherman Samuel I have been inspired by her spaces more times than I can count. 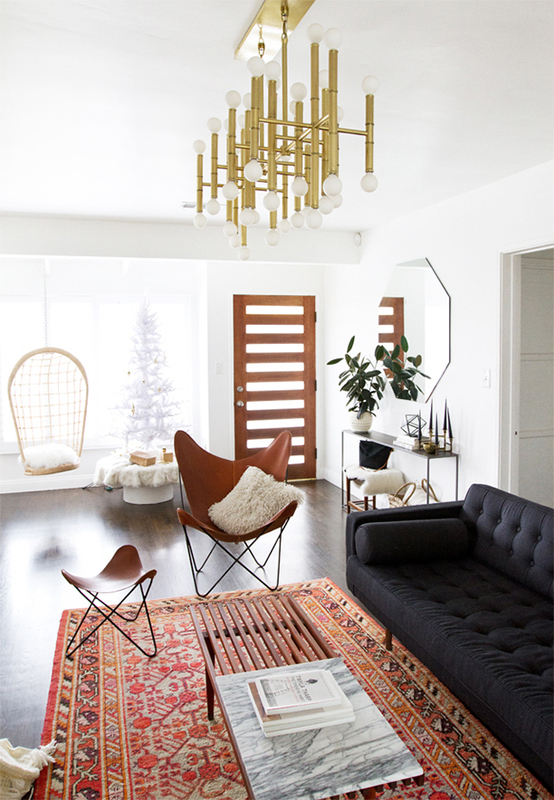 The eclectic but California cool look of her own home's mid century living room is oozing with inspiration. The light colored high ceilinged bones of the room provided a great canvas to layer the streamlined mid century furniture with Scandinavian boho accents. The jaw dropping Jonathan Adler light fixture really anchors the entertaining area which is centered with a rusty patterned rug. While the room is primarily neutrals, the varying shades of brown and rust and all the pops of white and brass add depth to the airy space. 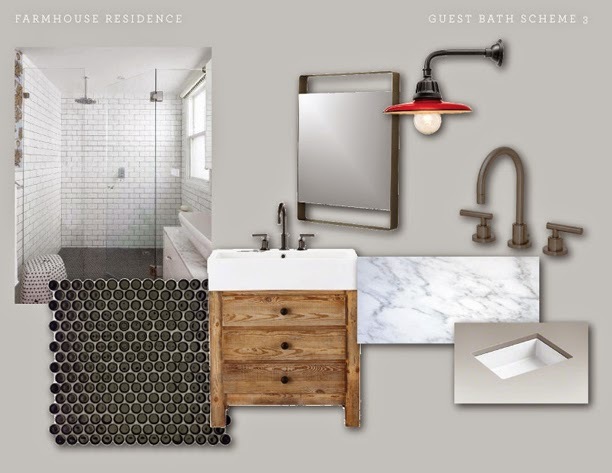 Hi Folks - We are down to our last concept post on the Urban Farmhouse Project! So far I've shown you the Master, Kid's Room, Guest Room, Living / Dining, and Play Room - plus all the finishes in the kitchen and baths. There is one more bedroom in the house. In the future this will become a nursery for a second child. But in the meantime it's a second guest bedroom and study. The owners wanted to use some of their existing furniture including a dresser and double bed. They also didn't want to spend a ton of money here. What was purchased new should be able to be re-used elsewhere or in a future nursery. 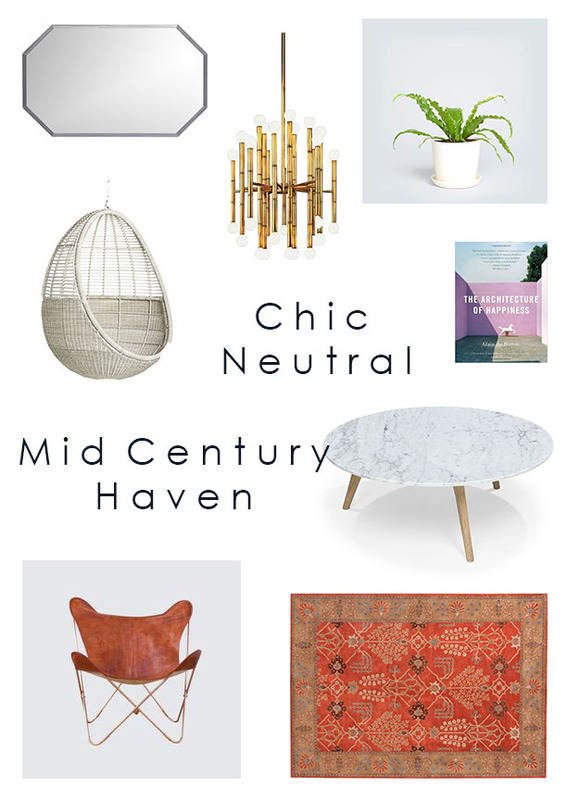 We did a West Elm rug and a fun rattan mirror from Target. I think this room will be nice and bright and a great space for guests until Baby #2 comes along. Can't wait to show you the final product as we get stuff put into place! Hi Folks! Jess Davis here with another post about my Urban Farmhouse Project. Last week I showed you the boy's room. This week we have the guest room. The room is small and the owners wanted it to feel light and airy. We found a concept image that gave us some direction and here is what we came up with. We utilized some furniture that they already had from their previous residence and paired it with a vintage rug and Los Angeles themed artwork. Here is the guest bath that adjoins the room. 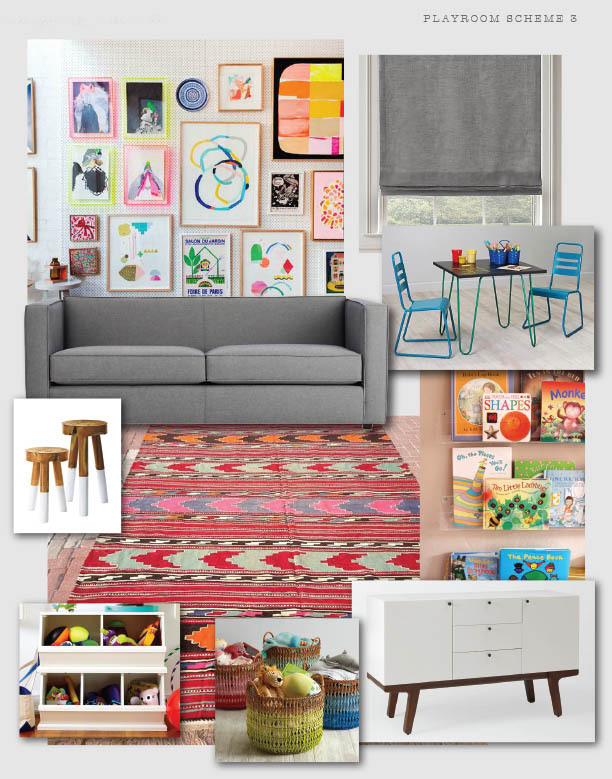 Looking forward to showing you the super fun play room next week! 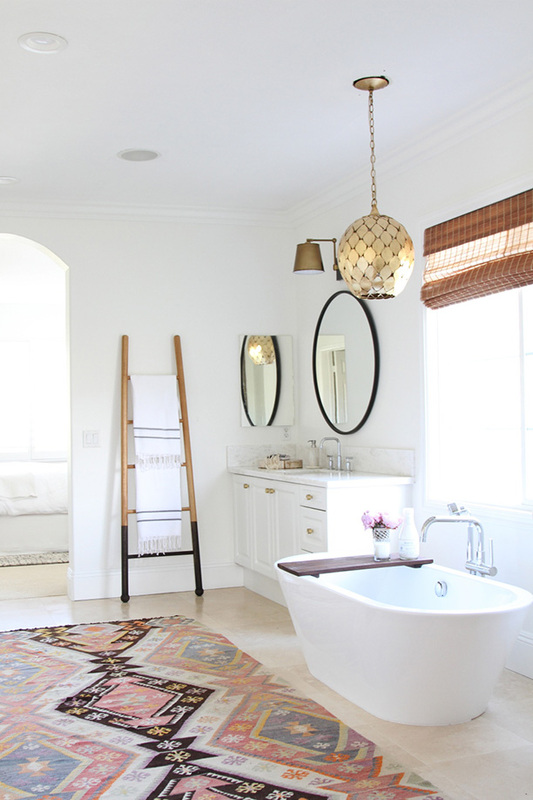 I personally believe that the bathroom should be one of the most soothing rooms in your home and when I ran into this bright haven by designer Becki Owens I was absolutely obsessed. 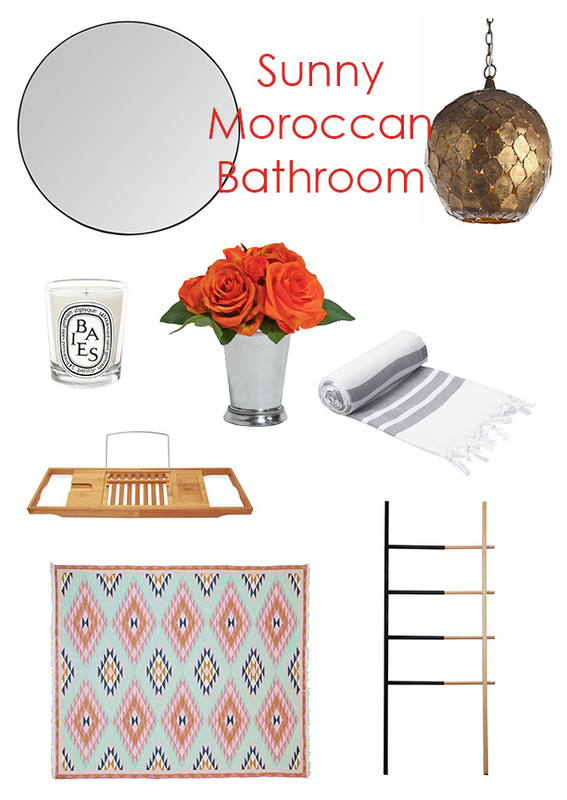 This already spacious white bathroom was styled to look slightly Moroccan by adding in warm global accents such as a kilim rug and turkish towels. The large round mirror opens up the space even more and the gold hanging light fixture and sconces add a touch of understated glamour.